Home » Is That the Same Girl? It has obviously been a long while since I’ve done anything with the blog. Halloween was the last real post and T-Bone has changed quite a bit since then. When last we met she was just starting to crawl and now she’s got standing down to a science and is working on walking. 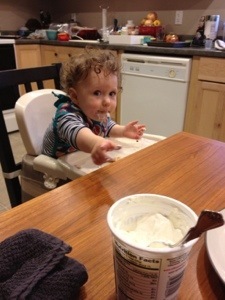 She has decided that she likes sour cream and is most definitely a carnivore who loves fruit. Books are a favorite pastime, her favorites being Quick As A Cricket and Brown Bear, Brown Bear, What Do You See?. She has 8 teeth (and counting – working on some molars). 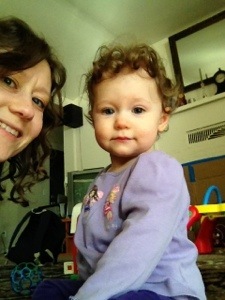 She also has curly hair now, which pleases her mama to no end. 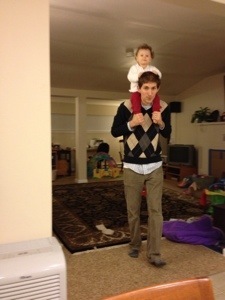 T-Bone turns one in a week, and her Papa and I can hardly believe it! She has changed our life and now we can not imagine it without her!